Hakuna Matata. Remember those words from Lion King? It's been many years since I saw Lion King and I don't even remember the story line. But now that I'm here, I realize that this film is all about Kenya and the animal kingdom here. Several production crew members actually traveled here to Kenya to Hell's Gate National Park (I've shown pictures from that park in past blog posts) to check out the landscape and the animals. The Lion King's name is Simba, which is actually the Swahili word for lion; Rafiki is Swahili for friend. There are probably other Swahili names and words that I'm not aware of. But back to hakuna matata. . . . It's Swahili for the concept of "don't worry; be happy." And that is definitely the mind set of a lot of people here. "Don't worry. I'll get it done today. If not today, tomorrow." "Yes, I'll be there today. If not today, tomorrow." "I'm coming right now. Well, maybe I'm starting to think about coming." Kind of hard for us westerners to get used to. There must be a happy medium between hakuna matata and the stress we westerners feel to "do it now . . . or yesterday!" It's been a hard, frustrating week. Some "political" complications with some Kenyans that we deal with have been upsetting. I've been fighting a sore throat and a tooth problem. There's been a lot of office work to get ready for the incoming missionaries. Then to top it off, I found out on Thursday that someone I work with has been sitting on postal slips for ten packages from parents to their missionaries and some of these slips are from November!!! That means that the packages have been sitting in the post office accruing storage charges all this time. So maddening. The parents want their missionaries to get the packages and the missionaries want their packages. Oh my. I was not impressed and let him know (hopefully in a firm but not rude way). On Friday when he brought all the packages, he said that he had learned a good lesson. So have I. He really is a very nice man. So I'm very sorry to all you missionary moms and dads out there who hoped your sons would get these packages for Christmas. Hopefully we can distribute them this coming week when transfers are happening. We'll do our best to get them out as quickly as possible. Our mission covers two countries and we can't use the postal system like we would in the West. Our missionaries in Kenya are spread from 10 hour's drive to the east of Nairobi to 10 hour's drive to the west and all on narrow, bumpy roads full of potholes, speed bumps, and heavy traffic. 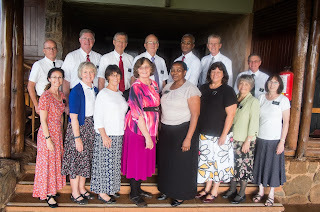 Missionaries in Tanzania are in three major cities: Dar Es Salaam, Arusha, and Mwanza, and we generally fly to those areas. But we'll do our best to get the packages out as quickly as possible. All the senior couples in the Kenya Nairobi Mission at our Couples Conference in December at Tsavo West National Park. I did a post about the conference but at that time I didn't have this picture. Everyone is here except my husband LeRon. He had been very sick the day before, which is very unusual for him. But the day of this picture, we had driven down from Nairobi (5 1/2 hour drive). By the time we got there, he needed to just go to bed so I went to the rest of the conference without him. L-R: Elder & Sister Petersen (LDS Charities based in Nairobi), Elder & Sister Ford (Public Affairs based in Nairobi but covering Kenya, Tanzania, Ethiopia, Rwanda, Uganda), Elder & Sister Colemere (Member/Leader Support, Mwanza, Tanzania), Elder & Sister Pehrson (Seminaries & Institutes, Eldoret, Kenya), President & Sister Msane (our fearless leaders), Elder & Sister Jones (Office and Member/Leader Support, Dar Es Salaam, Tanzania), Elder & Sister Jensen (Member/Leader Support and LDS Charities based in Mombasa, Kenya), Sister Torrie without her side-kick, Elder Torrie (Mission Secretary, Nairobi). Colleen, I just read "Beyond the pale" by a Canadian author, Emily Urquhart, and she talks about the albinos in Tanzania. There are people with albinism in Dar Es Salaam, too, but more in Mwanza. This book was so good and so interesting! It talks about the foundation in Tanzania called Under the Same Sun. http://www.underthesamesun.com/ So interesting. I just didn't think about YOU and Tanzania when I read the book--but then here you are mentioning the cities I just read about!